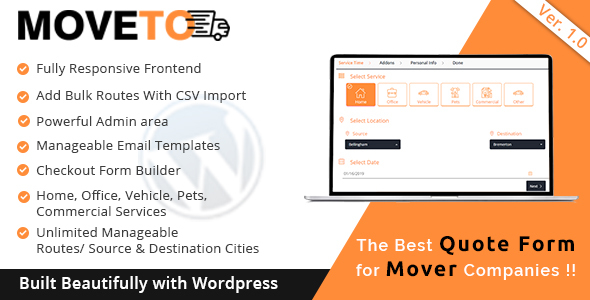 Moveto is a quote form plugin for movers or moving companies to get leads for their business, its very easy to use and very effective which can help their client to get the quote from movers website only and it will be helpful for the company owners to get new leads for their moving business. Moveto is built in wordpress and having very nice quote form and easy to process the quote from wordpress admin for business owner. Moveto can use for almost all type of services movers like Home,Office,Vehicle,Pets,Commercial,etc.